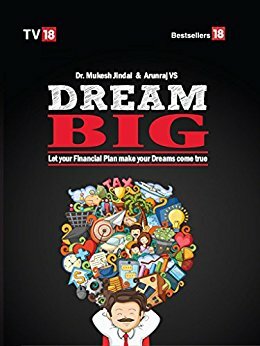 The Readers Cosmos: Book Review: Dream Big - Let Your Financial Plan Make Your Dream Come True by Mukesh Jindal and Arunraj VS.
Book Review: Dream Big - Let Your Financial Plan Make Your Dream Come True by Mukesh Jindal and Arunraj VS. Publisher: TV 18 Broadcast Ltd. This book is about how to plan investments. The correct title for it is "ABC of Investment Planning". I say this because the author begins first with highlighting the importance of financial planning and the advantage of doing so early on. While he does understand that the youth today is lured by the phrase of "living in the moment" made possible by credit cards. He just doesn't underscores the problem but gives a perspective of opposite lives, with and without saving for the future. His realistic approach to the problem at hand of us, the youth not understanding the importance of money and savings clicked the first chord with me. Everything he mentions about the generation today is true to its word. Moving on he begins to explain the future value of the current amount you have in hand and inflation. he does so by giving actual figures and statistics to make the reader understand the repercussions of keep the money as it is in the bank. Amongst my generation, broadly defined as "youth" the best we know to save is via fixed deposits. However current bank interest rates over fixed deposits are lower than the inflation rates, so even if you have a certain amount with you, if it doesn't grow as fast as the inflation does, your buying power with the same amount of money will reduce in the future. As a result you will need more money in future to buy things on your wishlist or that elusive vacation unless you make it grow faster than the inflation rate. Keeping money not invested or at low interest rates is loosing out on the money. All these facts become clearer and more real with the statistics given in the book. Having convinced the reader thus, the writer moves to the various avenues on funding. The focus on this book is particularly mutual funds. He begins with the history of their beginning and classifies them as per the type, risk, period, etc. This gives you an in-depth understanding of the topic, especially if you are a novice on the subject of mutual fund investments. He then goes on in detail of each type, the risks, the myths, etc. associated with them. There are also other investment options like insurance,pension schemes, etc. There is a dedicated section on things to consider while building your financial portfolio which summarizes the content above. Also specific sub-interest sections like one for women, senior citizen, child education etc. have additional ideas for these group of individuals. Lastly he delves into planning your legacy which is the major financial responsibility of every individual. Overall the book is a must for novices to understand financial planning from the beginning. This book will certainly broaden your perspective with knowledge of variety of options, especially the mutual fund sector which the author sort of has a bias (equipped with statistical data certainly) for. It will help you make better and more informed choices when you next talk to your bank or your asset manager, helping you protect and grow your hard earned money, a dream of every individual. RC Rating: 5/5 A must read! Highly recommended.